The NRC and Kiewit Infrastructure Co. hosted Rep. Gwen Moore (D-WI-4) for a tour May 30 of the Milwaukee Streetcar. 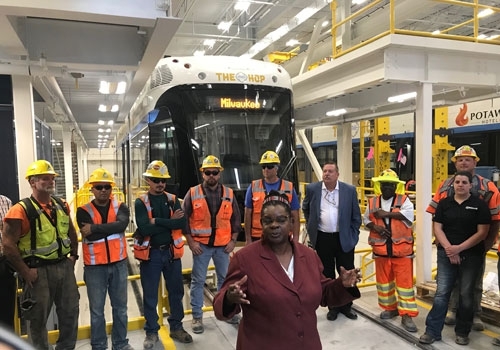 The National Railroad Construction and Maintenance Association (NRC) and Kiewit Infrastructure Co. hosted Rep. Gwen Moore (D-WI-4) for a tour May 30 of the Milwaukee Streetcar. Officials kicked off the tour at the City of Milwaukee Streetcar Operations and Maintenance Facility, focusing on the rail and station work Kiewit has done for the streetcar project so far. The Milwaukee Streetcar, also referred to as The HOP, is a new streetcar line being built in Milwaukee, Wis. 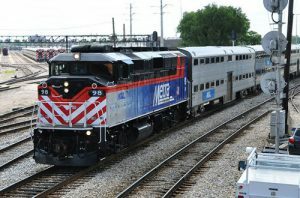 The 2.5-mile line will connect the Milwaukee Intermodal Station to the Lakefront and connect Downtown to key neighborhoods. 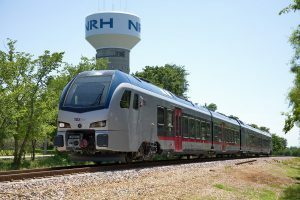 The city of Milwaukee was awarded a $14.2 million Transportation Investment Generating Economic Recovery (TIGER) grant in 2015 that allowed for the construction of the Milwaukee Streetcar’s Lakefront Line to progress, and the city also used local funds to support the project, NRC explained. Kiewit built the Milwaukee Streetcar rail and station infrastructure, which NRC said exemplified how private companies can work with public entities like the city to complete a project on-time and on-budget. Construction of the streetcar has taken 150,000 man hours of labor with zero lost time accidents, NRC said. 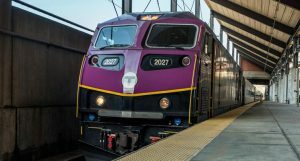 The project is set to open for service in November and recently received delivery of its second streetcar vehicle. Matt Bell, the NRC’s executive vice president/COO, organized the tour, which was led by Mike Ethier, Kiewit’s project manager, and NRC Board Member and Kiewit employee Dave Landreth. 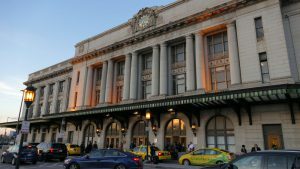 “Representative Gwen Moore was crucial in ensuring the Milwaukee Streetcar received federal transportation funding and we appreciate her leadership advocating for increased infrastructure investments for the City of Milwaukee in Washington,” Landreth said. Rep. Moore was elected in 2004 and is serving her eighth term. “It was a pleasure to join Kiewit to tour the construction of the Milwaukee Streetcar rail and station construction,” Rep. Moore said. “It is great to see that Kiewit and the City of Milwaukee are on track to exceed both the 40 percent Residential Preference Program hiring goal and the 21 percent DBE participation goal. The streetcar not only provided over 500 construction jobs to mostly Milwaukee residents, but when completed will foster local economic growth and development and improve the quality of life for Milwaukee residents. The group also highlighted Rep. Moore’s support for federal transportation grant funding such as the Capital Investment Grants (CIG) program and the Better Utilizing Investments to Leverage Development (BUILD), formerly the TIGER program.